In Memoriam – John Hill, 1945-2015, Designer of ‘Squad Leader’ | Armchair General Magazine - We Put YOU in Command! If there is a heaven just for game designers, it has a new archangel. John Hill, best known for designing the groundbreaking board wargame Squad Leader, passed away on January 12. He was inducted into The Game Manufacturers Association’s Academy of Adventure Gaming Arts & Design Hall of Fame in 1978; Squad Leader was inducted into the HoF in 2004. His many boardgame designs include Jerusalem (1975), Battle for Hue (1973), Battle for Stalingrad (1980) and Tank Leader (1986 and 1987), but John was always a miniatures gamer at heart, and anyone who ever got to play a game on his magnificent game table considered themselves lucky. Squad Leader was originally intended to be a set of miniatures rules, but the publisher, Avalon Hill, asked him to convert it to a cardboard-counters boardgame design. 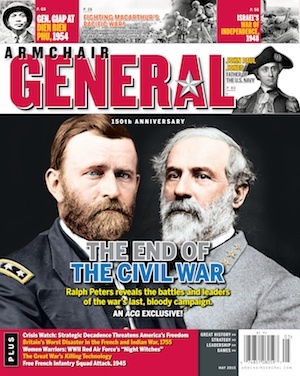 His Civil War miniatures rules Johnny Reb were considered so significant that even Fire & Movement magazine, which primarily covered boardgames, published a major article on the JR system. Most recently John designed Across A Deadly Field, a set of big-battle Civil War rules, for Osprey. He completed additional books in the series for Osprey that have not yet been published. On a personal note, John was my friend of many years. I was introduced to miniatures wargaming through a Johnny Reb game with John and one of the JR developers Dana Lombardy (designer of Streets of Stalingrad and other games). He never seemed to take himself too seriously. He had a unique, cockamamie way of interpreting and describing historical events that could force people to re-examine what they believed. With his high-pitched voice, raucous laugh and eyes that often seemed to be looking in different directions at the same time, he was a memorable, one-of-a-kind character. I doubt that anyone who ever gamed with him or heard one of his historical presentations ever forgot him—or ever will. He leaves behind his beloved wife of forty-six and a half years, Luella (Lu); his daughter Stephanie, and two grandchildren, Danielle and Carl Anthony. He also leaves behind a wargame hobby that is richer for his contributions and many heartbroken friends who will find it hard to believe we will never crack jokes or roll dice with him again. Thanks to friend Dana Lombardy, who knew John long before I did, for contributing to this article. Watch for Dana’s own tribute to John Hill in C3i magazine. John Hill’s most recent gaming project was designing Across a Deadly Field for Osprey Publishing. Although more widely known for his boardgame designs, including Squad Leader, John was always a miniatures gamer at heart. God Bless John and his family. Heaven gained an Incredible person and Game Designer. He helped me learn the game years ago and was wonderfully patient and understanding. His family was so Lucky to have had him the years he was with us all; and now he will be continuing his Joy for us all in Heaven. We lost a Giant in the gaming Industry much too early. Played his games for hours with my brother and friends. Very sad that his genius has been called to serve another diety. Another hero falls. One must remember it takes guts and persistence to design extraordinary games – and one never receives the deserved benefits. A great designer, but Jim – “hero”? What do you think he was owed? He had a great life, a happy retirement and lots of respect. What more could he possibly have wanted? Looks like he was playing games and having fun to the end, especially if the photos were taken in 2015, per the captions. A great man, mentor to me, and doting grandfather to my children. He will be greatly missed. I had the privilege of meeting John Hill one time just long enough to shake his hand and thank him for being my inspiration. If you’d have asked him, I doubt he’d remember. John Hill was my inspiration for designing games. ‘Design for effect’ was his watchword. Excruciating detail was less important than playing a game and getting feeling you were there. Heartfelt condolences to his family. They have lost a patriarch. We have lost a mentor. Yep, works for me. I never had the pleasure of meeting John — honestly, I’m not sure I even knew his name — but I know it now, and am saddened to hear of his passing. I spent many, many, *many* an hour poring over Squad Leader minutiae and battling friends and family across the chipboard battlefield in my formative years. John and designers like him made that possible, for which I always remain grateful. Condolences to his family and all those who miss him. Loved his games and he movers from Lafayette,Indiana after I found his shop that went in the flood and he moved, too bad for me. Have The historical WARGAMEs He made and several he worked on with others like Dana . There is a wargames get together in West Lafayette,IN. on Feb.14th, Playing his games and discussing them and him. Sage’s Shoppe on 52. So so long and Hold that Line and keep the boys a fighting who have gone on before you now in them ranks of wargames in the sky. Wow, what a great game. A group of us played many wargames in high school and college, but Squad Leader was on a different level than any other game we played at the time. The rules were longer and more difficult initially, but once you work through it, it was a fun and simple system to use. I still remember firing my first artillery barrage on my opponents troops who were in a wheat field. The barrage didn’t eliminate all of his units, but as a result of the barrage, the wheat caught on fire and many more units were destroyed. To a high schooler at the time, that was phenomenal. A great game by a great designer! God bless him. Advanced Squad Leader (purchased for my 10th birthday by my father who bought it on a lark) introduced me to a lifelong hobby. I have played many great wargames since, but none compare with SL/ASL. God rest his soul. Forgive the error….”Squad Leader” was the game my father bought me….I purchased ASL years later.